Without a doubt outside maintenance is important to a company, as this can make a lasting impression of what your company represents to the community. Equally, if not more important to outside maintenance is regular maintenance to the inside of your business as well. A common thing that is often missed when it comes to indoor maintenance is cleaning your upholstery furniture. This may be due to a variety of reasons such as not knowing how to clean it properly or not understanding why it is so important. In this post, we’ve included some tips when it comes to cleaning upholstery. After you are done reading this, you will not only understand why it is important, but also how to do it. Check cleaning codes. Before you begin cleaning the upholstery, you want to find out what kind of cleaning the manufacturer recommends. This information can be found on the manufacturer’s tags. On the tag you will find one of four codes, a “W” , “S”, “SW”, or and “X”. A tag with the letter “W” means the upholstery can be washed with water, “S” means it can be cleaned with a solvent, “SW” means either both solvent or water can be used for cleaning, and “X” means the fabric should be dry-cleaned only. If the tags are missing or have already been removed, test a small area with the detergent before you begin. Vacuum upholstery. Once you have determined what the manufacturer recommends, begin by removing any dust, dirt, or debris that maybe on the furniture. This can be done by brushing the fabric with a brush, or a vacuum cleaner can also be used. If the furniture has cushions, make sure to remove them in order to brush and vacuum underneath them effectively. Apply detergent. Even after checking the manufacturer codes, it is always beneficial to test detergent in a inconspicuous spot such as underneath the furniture before you begin. Dry the tested area with a cloth and allow to dry completely. If the detergent causes discoloration, do not continue with this detergent. After you have tested the detergent, gently apply it with a micro fiber cloth or a sponge to the upholstery. Be careful not to apply so much water or detergent that it overly saturates the fabric. Allow the detergent to sit for a few minutes and than wipe away with a damp cloth. Next, allow the fabric to dry thoroughly. You can do this either by air drying or using fans to speed up the process. A powerful detergent that is safe for upholstery is Nutri. Nutri works great for general cleaning as well as removing some of those tougher stains. This product also works great on upholstery because it is fast drying. Simply dilute as prescribed on the bottle and apply to the upholstery as mentioned above. Treating stains. It is only a matter of time until stains will appear on your furniture. As with any fabric, the best way to prevent stains is to treat spills right away. At times however, spills can go unnoticed and can become set-in stains. When this happens, you need to use a tougher detergent. A great tool for removing upholstery stains is Carpet Spot & Stain Remover. It is most effective against both oil and water based stains such as; dirt, grease, grime, tar, blood and gum. The best part is it won’t leave behind any residue, ensuring your upholstery will stay clean for a long time. Simply apply to your upholstery’s surface and blot the stain with a white cloth. Blotting is always important when working with stains, as scrubbing a stain can cause the stain the spread. Allow time for the product to dwell on the stain. After a few minutes, rinse with a damp cloth and once again, blot dry. Preventative measure to keep your upholstery clean. Vacuum regularly. Not only is vacuuming important in the preparation for a deep cleaning, but it is also important to keep your upholstery looking clean. Make vacuuming a regular part of your cleaning schedule to cut down on how often your upholstery calls for a deep cleaning. Flip cushions. Another thing that can be done to help your upholstery last a long time is to take good care of the cushions. They regularly should be taken outside and beat by hand in order to prevent dirt and dust from setting into the fibers. 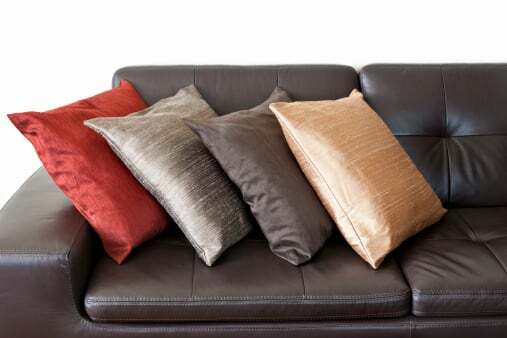 It is also good to flip the cushions in order to ensure that the cushions wear evenly. Protection. Some fabrics will allow you to apply a protection spray to the upholstery. This preventative measure can be very helpful in preventing spills and stains from getting into the fabric. If the fabric allows you to apply a protective coat, by all means take advantage of it. Always make sure to check with the manufacturer beforehand as these products are not always recommended for certain fabric types. This entry was posted in Furniture, General Cleaning, Janitorial and tagged Carpet Spot & Stain Remover, furniture, nutri, upholstery. Bookmark the permalink.